A man in a wheelchair rolled on to the tracks at Washington, DC’s, U Street Station, but he was rescued by bystanders before any harm could come to him. The video shows his rescuers acting fast, fearing an approaching train. Staff on Tuesday afternoon told the Washington Post the man was breathing, with some cuts and bruises to his face. 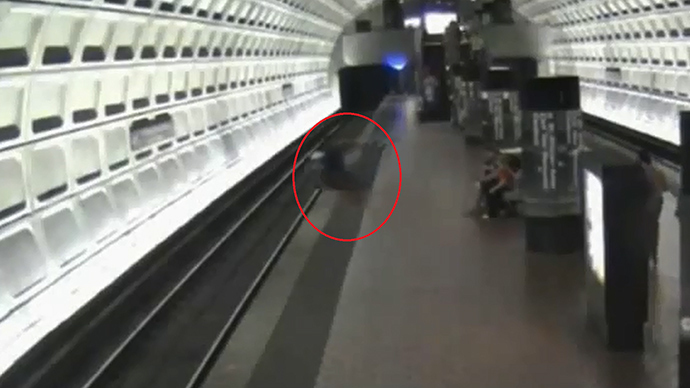 The video shows the wheelchair slowly careening off the platform and on to the tracks. Luckily, it missed the third rail, which is live. As soon as they saw what happened and the man lying motionless with his wheelchair by his side, two men jumped down to the tracks. It took them about half a minute to hoist the man up and manage to get his wheelchair back on to the platform. The next train happened to be three stations away, as luck would have it. Subway officials acknowledged the bravery of the disabled man’s rescuers, but cautioned commuters to wait for the station manager to cut the power to the third rail when accidents of this sort take place. Spokesman Dan Stessel clarified that the man “was not in imminent danger of being struck by a train,” but the third rail was live when all three were down on the tracks. The wheelchair victim turned out to be familiar to staff at the station and neighboring businesses. None of the individuals were identified. The man was taken to a hospital to care for his injuries, spokesman Mike Tolbert told the Washington Post. He did not clarify how the wheelchair ended up on the tracks in the first place.